"With THREE CHORDS & THE TRUTH, Craig McDonald has crafted a remarkable coda to the series." "Grabs the reader by the throat." 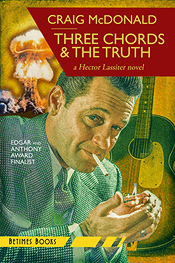 In 2007, the Hector Lassiter series launched with Head Games, a literary thriller set along the borderlands of 1957 America—an audacious road novel met with ecstatic reviews and international awards attention, including Edgar and Anthony nominations for Best First Novel by an American Author. With Three Chords & The Truth, Craig McDonald sets the capstone on the Hector Lassiter saga. It's winter, 1958. Johnny Cash and Sun Studios are ascendant in Tennessee, where a wicked snowstorm is doing nothing to cool racial tensions in Music City, USA, or points farther south. Despite the cold, the U.S. military is also sweating, fearing the worst after a flight crew has been forced to dump a hydrogen bomb off the coast of South Carolina--a weapon of mass destruction whose nuclear trigger has been left to rust at the bottom of the Atlantic Ocean, threatening the Carolinas with atomic annihilation. Once again, forgotten history and historical figures are reanimated and given new life and relevance through the Hector Lassiter series, nothing less than a literary Secret History of 20th Century America. In an up-from-the-heels voice that recalls his first-person narration of Head Games, Hector once again tells his own remarkable story, one that rounds out the internationally bestselling series BookPage has called "wildly inventive" and The Chicago Tribune declared "most unusual, and readable crime fiction to come along in years." This is a vintage Lassiter novel, at last revealing the ultimate fate of the author-screenwriter famous for living what he wrote, and writing about what he lived.